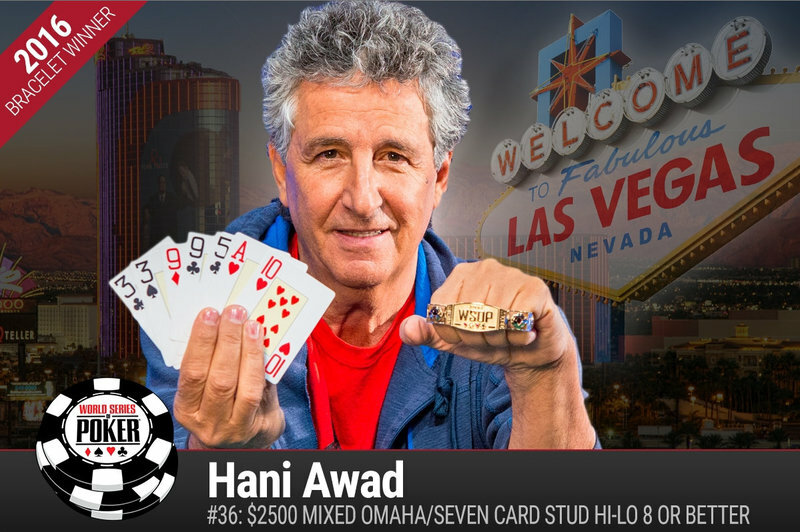 Hani Awad outlasted a field of 394 entries to win the 2016 World Series of Poker $2,500 Omaha eight-or-better and stud eight-or-better mixed event. The 65-year-old cab company owner earned $213,186 and his first gold bracelet for the win. Winning a WSOP title is a story on it’s own, but this victory was extra special in that Awad finished second in this very same event last year, losing heads-up to Konstantin Masiak. Awad was born in Nazareth, Isreal but now calls Las Vegas home. His mother, who still lives in Israel, underwent a major heart surgery last year shortly after he finished second in this event. He promised her that he would win the event in her name and he did just that. This time around Awad topped a tough final table that included the likes of former owner of Card Player Magazine Denny Axel (4th – $61,888), bracelet winner Michael Chow (5th- $43,717) and 2016 WPT Seminol Hard Rock Poker Showdown runner up Aditya Prasetyo (3th – $89,409). In the end it came down to a heads-up battle between Awad Fabrice Soulier, a bracelet winner from Avignon, France. Awad took a 3-to-1 chip lead into the final showdown and was able to convert the advantage into the win. Awad’s two pair were enough to scoop the pot and send Soulier to the rail as the runner up with $131,762.